Obesity – fat gathering in and around the throat. Dental Reasons – mispositioned jaw, caused by tension in the muscles. Alcohol or drugs relaxing throat muscles. Throat weakness – causing it to close during sleep. Nasal passage and sinus obstruction. Obstructive sleep apnoea – indeed snoring can be one of the first symptoms or signs of sleep apnoea in a person, and is almost always present in sleep apnoea. Sleeping on the back – leading to the tongue dropping to the back of the mouth. The tissues at the top of the airways touching each other. Whilst incidences of snoring can vary, it is estimated that at least 30% of adults snore. The impact of snoring occurs both for the snorer and those who sleep with or near them. The impact can include sleep deprivation, daytime drowsiness, lack of energy and focus, irritability, decreased libido and potential psychological problems. 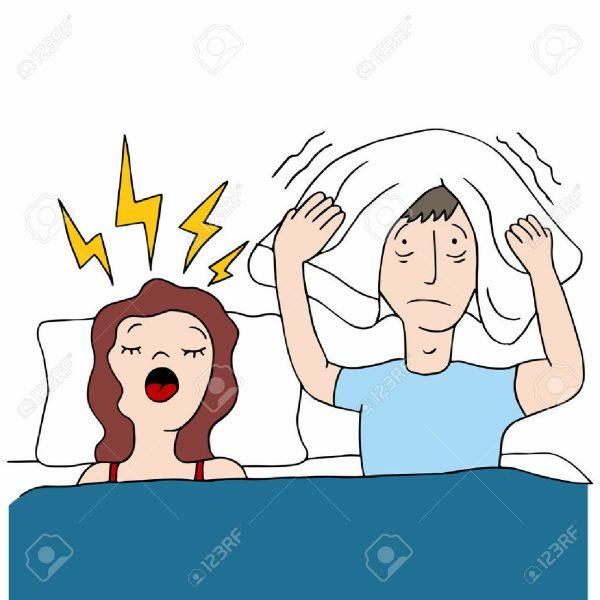 A correlation between loud snoring and increased risk of heart attack (+34%) and stroke (+67%). Development of carotid artery atherosclerosis (due to turbulence in the artery closes to the airways). Significant improvement of marital relations following correction of snoring. Having patients sleep on their side. Over the counter aids – nasal sprays, nasal strips, nose clips, lubricating sprays, anti-snore pillows and clothing. Dental appliances – splints (mandibular advancement splints – are far more compliant than CPAP machines). The Pillar Procedure – surgical insertion of strips to strengthen the soft palate. CPAP machines – continuous positive airway pressure machines – mainly for sleep apnoea. Is quite invasive as it requires wearing a mask and having a machine beside the bed (that can be noisy). Compliance is as low as 13%. Surgery – i.e. removal of tissue in the back of the throat (although this involves risks of side effects, including scarring), or turbinate coblation (removing obstruction caused by enlarged turbinates in the nose). Pharmaceuticals drugs or herbal preparations. Note: it is recommended you read the previous blogs on breathing, nose breathing and the Bohr Effect, relevant to snoring on this website prior to reading this section, as the following is a simplified summary based on a knowledge of this theory. The Breathing Dynamics approach to snoring addresses an aspect that is prevalent in most snorers. That is mouth breathing at night. Up to 6 times the volume of air can travel in and out of the mouth compared to the nostrils. Given the anatomical, physiological and biochemical make-up of our respiratory system is designed for us to breathe through our nose, the increased volume of air flow experienced during mouth breathing can not only increase the air flow in the throat and likelihood that any obstruction or loose tissue will rattle, it can seriously upset our blood chemistry and reduce delivery of oxygen from our arterial blood to our cells for energy production (based on ‘The Bohr Effect’) and lead to smooth muscle constriction or spasm in the respiratory, circulatory, lymphatic, urinary and digestive systems (any systems that involve tubes). This can obviously lead to a number of symptoms throughout the body. In addition, in normal breathing (according to diagnostic norms), not only should you breathe through the nostrils only, your tongue should rest at the roof of the mouth, preventing it from falling to the floor of the mouth and obstructing the throat (as is often the case during mouth breathing). An obstructed throat at night can or will usually results in snoring. When you breathe through your nose, with your mouth closed, your tongue will naturally sit at the roof of your mouth. Ensure that the mouth is closed at night – there are a number of techniques to achieve this, sometimes initially involving the use of other techniques or interventions such as dental splints or retrainers (especially if there is obstruction due to the positioning of the mandible) in addition to our techniques, but, over time, this can become habitual. Retrain the person to habitually breathe at all times using the nose, not the mouth. This second aspect takes time and requires the use of breath hold techniques to increase the body’s tolerance to elevated CO2 levels (as are seen when breathing through the nose and with patterns that promote breathing at the right rate and volumes) and CapnoTrainer biofeedback technology to retrain functional breathing patterns that will have your body become more comfortable with nose breathing and slower breathing rates with reduce volumes of air flow. Once your body becomes more used to breathing with mouth closed (except when eating or talking/singing), and with reduced air flow and breathing rate, this eventually becomes more habitual. To book in for a consultation to see Tim regarding the use of Breathing Dynamics to prevent or treat asthma, email Tim or call 0425 739 918. Alternatively, the Breathing Dynamics for snoring and subsequent breathing retraining techniques and rhythm development can be purchased via the shop section of this website.